Next: What Is Legal Structure? A nonprofit organization is a nonprofit corporation formed for not-for-profit purposes. This legal structure—the nonprofit corporation—is established at the state level and that not-for-profit purpose is declared when the nonprofit corporation is formed. Obtaining 501(c)(3) or some other federal tax exemption status does not define whether the entity is a nonprofit. In fact, you can form a nonprofit organization and decide not to pursue 501(c)(3) or other federal tax exemption status. Many nonprofits are easily recognized because of their dedication to an altruistic mission. Examples include a public charity supporting cancer research or endangered animals, a private foundation granting support to public charities, churches or other religious organizations, or a fraternal organization such as a homeowners’ association. 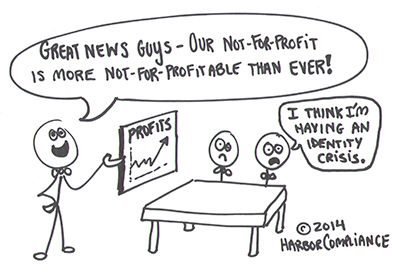 Don’t be fooled by the term “nonprofit”! Despite the name, organizations can and should produce profits. What distinguishes a nonprofit from a for-profit is what the organization does with its profits. While for-profit businesses may distribute profits to shareholders, nonprofit organizations reinvest profits in the cause of the organization. Nonprofits don’t pay dividends to investors, but they should pay reasonable salaries to employees and invest in building strong programs. Your nonprofit organization is defined by its legal structure, not its tax exemption status. Your nonprofit organization must commit its profits to its cause, not the financial benefit of the owners or investors. You can be a nonprofit organization whether or not you ultimately obtain 501(c)(3) or other tax exemptions.